Combo Deal, buy together and Save, 6 100% cast iron stocking hooks, strong sturdy, beautiful stocking holders. 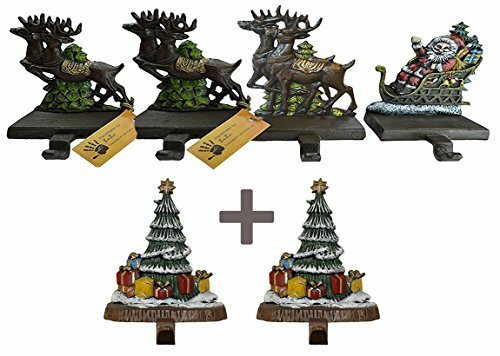 Design of Santa Claus & 3 Reindeer Stocking holder in set of 4 pcs plus 2 cast iron decorative tree stocking holders, measures 8" height. Festive design, especially made for the occasion, by Lulu. Hand made and hand painted in Christmas colors by our skilled craftsmen, quality speaks for itself. Perfect for holiday gift, Christmas gift, will be adored by family and friends.